Swiss manufacturer Stadler is producing a total of 58 Flirt UK electric and electro-diesel multiple-units for use by Greater Anglia. Construction is underway at the Swiss factory. The order placed in August 2016 as part of a programme to completely renew the Greater Anglia fleet includes 24 four-car and 14 three-car electro-diesel units. They will be deployed on rural and regional routes from Norwich to Sheringham, Lowestoft, Great Yarmouth and Cambridge, from Ipswich to Felixstowe, Lowestoft, Cambridge and Peterborough and on the Marks Tey – Sudbury branch. ‘The new bimode trains will be better for the environment as the diesel engine is newer and more efficient than on existing trains, and they can take advantage of running on electricity wherever there are overhead lines’, said Mike Kean, Greater Anglia Franchising & Programmes Director. Stadler’s UK Marketing Director Ralf Warwel said the units would provide ‘flexible, comfortable and interruption-free’ operation, with the use of a power module rather than underfloor engines helping to reduce vibration in the passenger saloons. The design is also suitable for future conversion to full electric operation or the use of batteries for energy storage. Facilities will include free wi-fi, power and USB sockets, air-conditioning and accessible toilets. 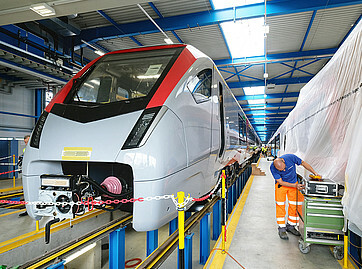 Stadler will also supply 10 electric-only units for services from London to Stansted Airport, and 10 inter-city EMUs for London – Norwich services. The order for the 58 Stadler trainsets is being financed by the Rock Rail East Anglia joint venture of Rock Rail, Aberdeen Standard Investments and GLIL Infrastructure. As recently reported, here Bombardier Transportation is to supply Greater Anglia with 89 five car and 22 10-car EMUs for outer suburban services under a separate £900m deal financed by Angel Trains and Commonwealth Bank of Australia.